Eileen West Nightgowns - influenced by the sweet and sunny climes of cool and breezy California, Eileen West sleepwear is known for luxurious sleepwear styles in comfortable fabrics that keep beautiful lingerie enthusiasts coming back for more. From lightweight short cotton nightgowns and womens robes to long and flowing full length gowns, follow along and discover the top 5 essentials that you need to know about this luxury sleepwear brand. When it comes to ladies sleepwear that's fashionable and comfortable, Eileen West nightgowns are designed to suit virtually every body type. When it comes to finding a nightgown that's tailored to your unique shape, there are many great choices. Influenced by the cool blue skies of California, these light and airy nightgowns incorporate fresh colors and delicate floral prints fpr an ultra feminine look. Whether you're a fan of luxurious Victorian inspired long gowns with pretty lace details, soft and stretchy sleeveless short nightgowns, or warm and cosy Lanz of Salzburg long nightgowns, there’s something for every preference and occasion. No matter what sleep wear style you crave, Eileen West offers a fantastic range of beautiful nighties that are available from sizes small to 3X. Mix and match with sleep wear favorites for a classic, romantic look that you can enjoy for years to come. 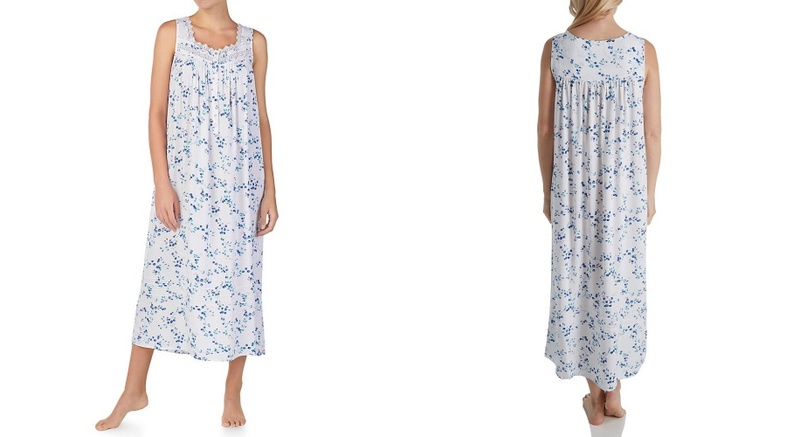 Queen Annie's Lace – This sleepwear line is well known for its elaborate cotton heirloom and silk sleepwear. 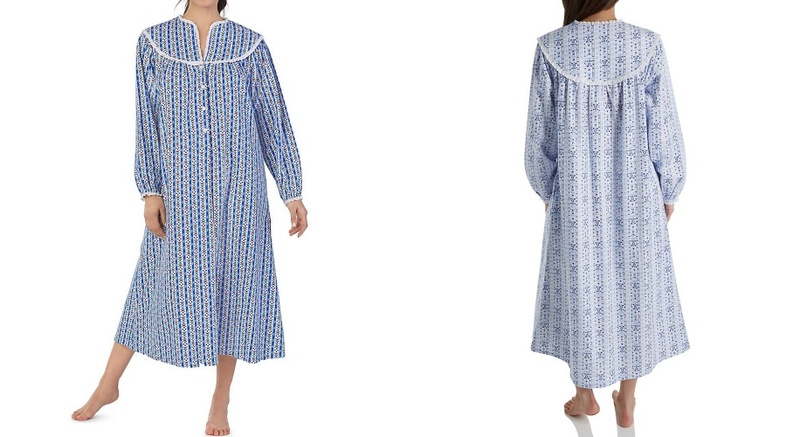 Lanz of Salzburg – Classic and cozy flannel sleepwear in traditional European prints, Lanz nightgowns are the perfect choice for those cold winter months. 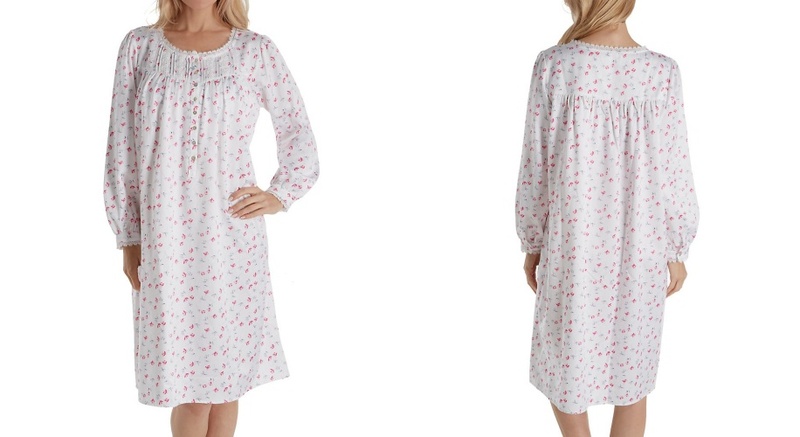 One of the best things about this popular ladies sleepwear - there's no scratchy lace, cumbersome trims, or uncomfortable fabrics with an Eileen West night gown. Eileen West sleepwear has an amazing reputation for easy fitting, stylish nightgowns, and pajamas and robes with a cozy and easy, relaxed fit - staying true to their philosophy of luxury sleepwear with a classic feminine look and feel. Cool cotton nightgowns, soft stretch knits, and modal favorites are pretty, practical and long-wearing, making them a great choice for everyday wear. Once you slip into one of these luxurious nighties, you may never want to take it off. In addition to soft and comfortable fabrics that are both sleep and lounge wear worthy, Eileen West knows that when it comes to stylish nightwear that's fabulous AND functional, a touch of luxury is the ultimate icing on the cake. From pretty ladies nightgowns embellished with luxurious lace detailing and trims around the neckline that are timeless and classic to heirloom lace, silk trims, and exquisitely hand painted prints, you’ll fall in love with the indulgent qualities of Eileen West nightgowns. Truly a treat to wear, these womens nightgowns make a great gift to yourself, one that you can enjoy to make any evening feel special. Better quality intimate apparel fabrics tend to last longer than less expensive ones, especially if you wash and store them properly and treat them with the special care that they deserve. Among the many great attributes of Eileen West nightgowns are high quality fabrics and meticulous attention to detail. You won’t find low end fabrics or cheap synthetics with this sleep wear manufacturer. Eileen West is known for comfort and quality, and they offer some of the best intimate apparel fabrics in the world. From soft weightless cotton nightgowns and sumptuous knits to sensational modal blends, quality control standards ensure that their night gowns and sleepwear styles feel like a dream every time.